Economy Crashing: it’s the socialism, stupid! I think its funny how everyone is looking at inflation, downturns in the stock market, long-term prospects for growth, unemployment rate, weakened banks in Europe and scratching their heads wondering – how does this happen? What’s going on? Simple answer – It’s a fundamental sickness called statist or socialist policies, AKA big government and central planning that have caught up with us. Europe’s decay took a little longer because it had the luxury of outsourcing their military needs to the US and saving a few bucks along the way, and the US took a little while because we had to build the modern American socialist state, and ease everyone into it. But, now that the wonders of central planning and big government intervention are benefiting the whole world – we have really arrived…decreasing prosperity for all – yeah!! But, that’s the real goal of a socialist state, right? Even the playing field for all, not actually caring if that newly evened playing field destroys prosperity for everyone. I mean – look at the much heralded Cuban healthcare and education system – everyone has access to the same garbage system, so yes – you can say there is 100% coverage. Never mind that people are starving, dying and give anything to leave the country. But is it equal – yes, I suppose it is…for everyone, but those in power. It’s with the best intentions the “New Deal,” “Great Society” and every other prosperity destroying, Keynesian friendly formula were thrown into making an all-powerful state the ultimate fixer to our problems. Like the ultimate Xanex – the State! So where lies the blame? Well, it’s a few things – first of which is the state manufactured economic “boom,” better known as a period in which productivity expands far beyond what economic fundamentals justify. Institutions like the Federal Reserve create artificial stimulus to the economy by inflating the supply of money through printing of cash or manipulating credit by controlling interest rates designed to encourage lending and stimulate or control the market an “appropriate” pace. But, the dirty little secret is – successful central planning of an economy is impossible because typical and naturally occurring signals which would cause markets to expand or contract are hidden or ignored through artificial manipulation of those same signals when central planning is implemented. Central planning completely ignores the real market. Therefore – and this is the important part – unnatural “booms” inevitably result in even larger “busts” because the market was never permitted to make smaller, more incremental corrections as needed. The central planning policies used by the State create the problems and then prescribe more of the same policies as the remedy. Over a few years and economic cycles, the free market dies, and central planning is all that remains, and like a drug – every person and industry is slowly dependent on the state just to get by. See Walt Williams, The State Against Blacks, for how that altruistic government model of the all healing, all helping hand of big brother has worked out for the black community – horribly, in case you needed a reminder. And it’s all done with good intentions, as are most socialist policies – with motivations like housing for everyone, and state manufactured (and even owned) businesses – see Fannie Mae (New Deal era) and Freddie Mac (Great Society era) for examples. See policies like Carter’s Community Reinvestment Act which planted the seeds for the mortgage boom. That policy, with stronger backing for Freddie and Fannie was advanced to brave new levels by George HW Bush and Bill Clinton – yes, that’s bi-partisan support for central planning idiocy! A little case study for you –manipulated signals of plenty of cash and low-interest rates (from the Federal Reserve) directly contributed to the mortgage boom, then catastrophic bust coming to fruition in 2008. Both buyers and lenders engaged in behavior natural market adjustments would have signaled against had central planning not been attempted. The additional factors were that government regulations, laws and incentives (made possible through Freddie, Fannie, Reinvestment Act and much more) actually created the means for the private market place to make decisions it would have previously shunned – all because master planning was deemed appropriate for manufacturing prosperity or equality (depending on which side of the aisle a Congressman sits). Home ownership was considered a right, so through multiple Presidencies, laws were passed to force banks into new types of lending, when in the past – they were not in this business. The market adjusted to demand of new buyers in the market place– home purchases and prices rose, and banks sought to diversify this new, and government incentivized, risk through credit swaps and securities. Because of this new economic policy and law provided by the “full faith and credit” of the US government – the entire economy began running on a view of endless growth and cheap credit. We embraced the artificial “boom” created by bad laws and bad monetary policy. Of course, it all busted in the end costing the middle class much more than they earned along the way, and continues to cost them through inflation. But, don’t worry – the government dependent big businesses who embraced the whole scheme were bailed out, and the US government has done absolutely nothing to correct the real problem. In fact, it’s now bigger than ever with the same crony corporatists enjoying their wealth protection on the backs of the American taxpayer. But – hey, central planning, socialist policies and big government work great, right? Who is ready for round two? It’s coming. 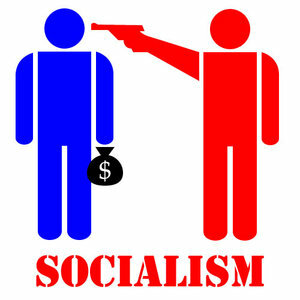 If you want to stop killing the economy, don’t use socialism and central planning as your guide. Stop using the tools that CAUSED the problem to FIX the problem. It will not work. It will just yield the same results over and over again. Economic growth must be based on real factors, not phony stimulus. Unfortunately, central planning has become a bi-partisan approach with both W and Obama most recently approving of such methods like many before them. Both had stimulus packages. Both engaged in monstrous spending and governmental growth to fix problems. Both allowed an unchecked federal reserve to increase money supply and keep interest rates artificially low. Both tried to pick winners and losers through subsidies, regulations and laws. Both are using the military to perpetuate the problems and justify the spending. We continue to arrive in the same place and ask ourselves how we got there. Are you kidding me? It’s obvious. The real solution — strengthen personal and economic freedom, and you will get prosperity. Various forms of socialist policies and central planning continue to be used and must be ended: a progressive tax system, government subsidies, targeted regulations, departmental bureaucracies, Medicare, Social Security, Medicaid, welfare programs, the military industrial complex, the newly formed climate industrial complex, etc. Couple these horribly irresponsible uses of the state with flawed monetary policy from an institution with no congressional oversight (like the Federal Reserve) and you have created a perfect recipe for the death of prosperity, aka – modern Western economies. The fixes to these problems are so easy, it’s scary. Unfortunately, both sides in DC have come to accept economic central planning and socialist policies as the only way to “fix” our economic problems. With very little real diversity in their approaches to the economy – don’t count on real changes any time soon. Most politicians are there to be heroes, when what we really need them to be are stewards. Less is always more. Let’s have policies with deconstructing the centrally planned system as a goal, not reinforcing it. That would really do some good.